This memorial keepsake locket is a beautiful and meaningful bereavement gift that will be treasured by the recipient for many years. A locket is a traditional way to keep the memory of a recently departed family member close to your heart. 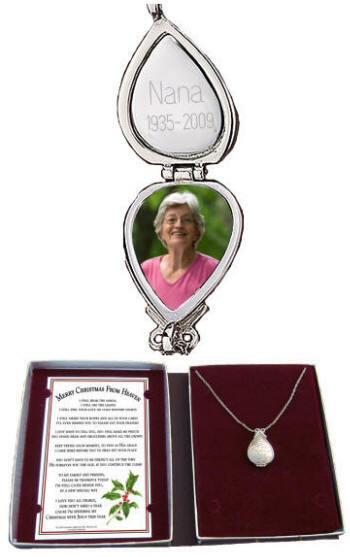 This keepsake memorial locket has a place for a loved one's photo. Enclosed with the locket is a template to assist with the cutting and shaping of the photograph, approx. 3/4 in. x 5/8 in. Also enclosed is an engraving plate which we will personalize for you if you desire with any name up to 9 characters and any two years. This keepsake memorial locket is packaged in a burgundy and silver keepsake gift box, along with a card containing the complete John Wm. Mooney Jr.'s poem, "Merry Christmas from Heaven". The pendant is in the shape of a tear drop and is engraved on the front with the inscription "I am with you always", and two doves. The back of the locket is inscribed "Merry Christmas from Heaven". The chain links both the front and back of the locket symbolizing an unbroken love. This is a truly beautiful bereavement gift that will give comfort through the holiday season and the rest of the year as it is worn every day. This pendant is created from lead free pewter and is plated in silver rhodium. New improved and easier to read bookmark features the entire "Merry Christmas From Heaven" poem. The words speak to our hearts reminding us that those we love in heaven remain a part of our Lives. Their Love is forever a part of us and although we feel loss we have reason to rejoice. They are home. They are "Spending Christmas with Jesus this year." Locket is 1/2 in. high, 3/4 in wide, chain is 20 in. long. locket and chain, poem card and gift box.